It is Mother’s Day at the end of the week, which is a good time to speak a little louder about the difficulties of being a mother and working in theatre. I have never fully subscribed to Cyril Connolly’s old chestnut about there being “no more sombre enemy of good art than the pram in the hall”. But there is no doubt that theatre and family life are not a natural pairing. I certainly wouldn’t have been able to sustain a career as a theatre critic without the heroic support of my partner and parents. So, it was good to see someone as respected and high profile as Rosalie Craig speaking up about the situation facing parents and carers in theatre at an event to honour this year’s Olivier nominees. Nominated for her role as Bobbie in Company, Craig spoke of the need for the industry to be more flexible and human, pointing to the difficulties for parents and the challenges she herself has faced while trying to do a West End run and “wanting to be a good parent at the same time”. These interventions matter. When stars start speaking out, especially about long-hidden issues, they gain traction. It is when people such as Adrian Lester have talked about the lack of roles for artists of colour or Julie Walters has bemoaned the increasing lack of socio-economic diversity in theatre that the industry starts to take note. One solution to the issues facing parents and carers, Craig pointed out, was job shares, which need to become more widespread in the industry. It is astonishing that it was only last year that history was made when Charlene Ford became the first performer to job share in the West End. As the excellent campaign by Parents and Carers in Performing Arts has shown, the difficulties faced by parents in the industry is also a diversity issue because when we exclude anyone we are narrowing the pool of talent. There are clearly costs involved in job shares and accommodating the needs of parents in rehearsal schedules. While doing nothing may bring short-term economic gain, it leads to long-term losses if that excludes a significant portion of a trained and experienced workforce from being actively involved in the theatre. For those making their own work, the difficulties faced in keeping careers going after children are even more pronounced. As Tonic has shown in its work with theatres, being a freelance is always a precarious situation and female freelances often find that that they earn less, have lower profiles and progress more slowly than their male counterparts also working as freelance directors, choreographers, designers or sound and lighting creatives. Those who do succeed in sustaining careers over a number of years often find it hard to pick up the threads after they have children, not only because of the costs of childcare (which most freelance fees don’t even begin to cover) but also, simply put, if you take time out you lose visibility with programmers and funders, and there is always a queue of people ready to take your place. 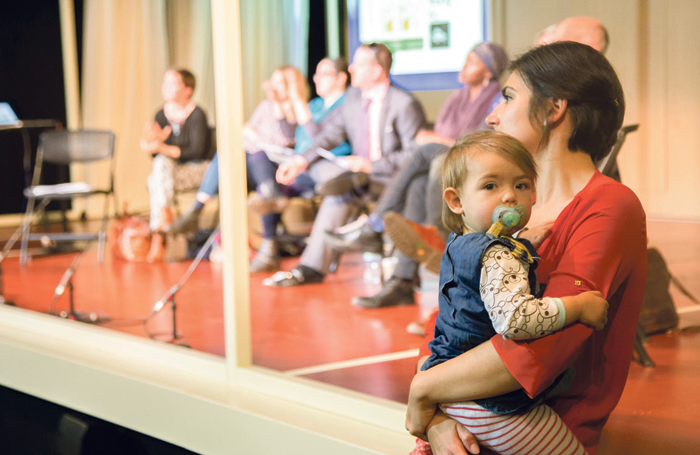 It is often only the most successful within the profession, directors such as Katie Mitchell and Marianne Elliott, who can command the fees necessary to pay for the childcare that starting a new project demands. Or those lucky enough to have family members nearby who could take on caring duties in order to facilitate careers. There are other issues for parents that don’t stop when their offspring are no longer babies. One company recently pointed out that when buildings offered to share resources by supporting residencies, that potentially means being away from home for extended periods during term time when children are at school. I think Craig is right when she talks about the industry having to learn to be “more human”. That means producers and venues not just thinking about their own needs but also the needs of everyone with whom they are working – and the needs of those they could work with if they were more sensitive to their caring responsibilities. Some clearly are. Early next month Encounter, who made the uniquely weird and wonderful I Heart Catherine Pistachio, are premiering a new piece, The Kids Are Alright at the Place. It is being produced by Fuel and will premiere just three years after one half of the Encounter duo, Jennifer Malarkey, gave birth. Malarkey says that having twins and trying to make a new piece of work would most likely have been impossible without the support of Louise Blackwell and Fuel. That’s a producer being more human. Others should follow suit.